I got this movie on DVD only because it had Amitabh Bhachchan starring in it. I didn’t think it would be a great story but I was in for a surprise! Perci Trachtenberg is regarded as the greatest mathematician of all time. 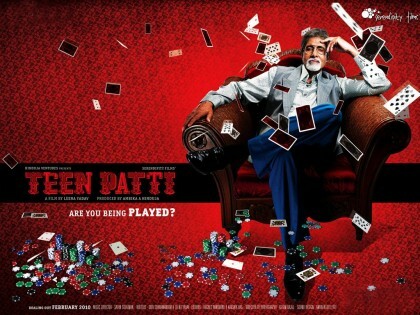 The setting is that of a casino in London where he meets Venkat for the first time. Venkat Subramanium is genius mathematician from India who is extremely reclusive. Venkat goes on to tell Perci of a formula that could change the way of mathematics forever except that Venkat lives with an indelible impression of guilt. A flashback shows that Venkat experiments with a game called Teen Patti on the internet. This is like a poker game and according to his experiment, if a player playing Teen Patti knows all the three cards with one of the players it is possible to guess the other cards with the rest of the players. Basically one can guess who is going to win on the theory of probability. Vankat gets sweet-talked by Shantanu to use his theory in the real world and actually go and play at illegal playing dens. Venkat has no interest for money but is swayed by Shantanu’s persuasion and is keen on practicing his equation and with the help of some students they all start frequenting different dens, casinos, private parties and clubs. It starts off as an experiment but the game soon goes out of control. The greed for more money takes over and they eventually start betraying each other. The consequences are disastrous at the end. I loved the last bit of the movie where Venkat is finally recognised for his efforts and honestly speaking, I just loved seeing Cambridge too. Watch this movie. I highly recommend it. Amitabh Bhachchan keeps outdoing himself with just about every new movie these days.